Summary: Like Eloise growing up in the Plaza Hotel, Charlotte Silver grew up in her mother's restaurant. Located in Harvard Square, Upstairs at the Pudding was a confection of pink linen tablecloths and twinkling chandeliers, a decadent backdrop for childhood. Over dinners of foie gras and Dover sole, always served with a Shirley Temple, Charlotte kept company with a rotating cast of eccentric staff members. After dinner, in her frilly party dress, she often caught a nap under the bar until closing time. Her one constant was her glamorous, indomitable mother, nicknamed "Patton in Pumps," a wasp-waisted woman in cocktail dress and stilettos who shouldered the burden of raising a family and running a kitchen. Charlotte's unconventional upbringing takes its toll, and as she grows up she wishes her increasingly busy mother were more of a presence in her life. But when the restaurant-forever teetering on the brink of financial collapse-looks as if it may finally be closing, Charlotte comes to realize the sacrifices her mother has made to keep the family and restaurant afloat and gains a new appreciation of the world her mother has built. 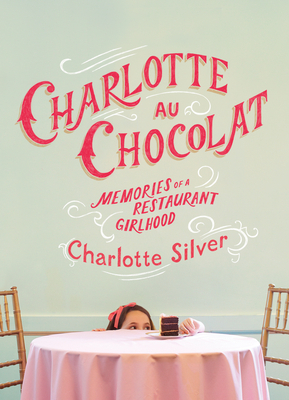 I'm not entirely sure that it was just one thing that made me pick up CHARLOTTE AU CHOCOLAT: MEMORIES OF A RESTAURANT GIRLHOOD by Charlotte Silver. I do enjoy the occasional memoir and I adore books with food as a main theme, but I think it was Beth Fish Reads' feature that pushed me over the edge. After reading her teaser, I was hooked and I just knew I was in the mood for book like this. I don't want to say that I was surprised by how much I enjoyed CHARLOTTE AU CHOCOLAT, but I kind of was. I figured I'd like this story about a young girl growing up in her mother's restaurant, but I was pleasantly surprised by how charming it was. I sat down to read a few chapters and ended up finishing it in one sitting. It was a quick read, but it was also an interesting story; and of course, I loved all the gorgeous descriptions of food. One thing that really stood out to me about CHARLOTTE AU CHOCOLAT was the author's honestly in writing her story. I loved her voice and it just warmed my heart to see how she fondly remembered the restaurant. There is no doubt that her childhood was a bit different than most kids' -- she spent all of her time away from school at a gourmet restaurant dressed in petticoats, but she seems to appreciate in many ways the unique things she experienced as a result of her mother's career. However, Ms. Silver's childhood was far from happy, or at least that's how I perceived it. She writes about her parents' divorce and the effect it had on her. She also mentions that she spent much of her childhood at the restaurant just waiting, and she missed out on many of the things that "normal" kids experiences. She also shares that while Upstairs at the Pudding was a glamorous restaurant that catered to the rich and famous, it wasn't always profitable. Charlotte's mother was constantly struggling to keep not only the restaurant afloat while also fighting to keep her lease on the building. And her dedication to the restaurant often left Charlotte alone and wanting for her mother's attention. At it's heart, this book was a touching remembrance of a restaurant from the past. Charlotte's memories of her childhood at Upstairs at the Pudding just jumped off the pages of this book with her vivid descriptions of both the decor and the food. The details surrounding the appearance and smell of each dish was incredible; and even though I probably wouldn't even try most of the dishes, I appreciated the beauty of the presentation. I loved seeing how Ms. Silver viewed the restaurant as a young girl, and I thought she did an amazing job of capturing the essence of her younger self. But it was how the author paid tribute to her mother that really made this book special to me. When Charlotte's father leaves, her mother decides to take over the entire restaurant -- both the management and the cooking. Charlotte not only looks back fondly on the restaurant, but she also reminisces about how much her mother sacrificed to keep the restaurant going. Charlotte's mother seemed like an incredibly strong woman (albeit absent a lot from Charlotte's life), and I appreciated that Charlotte chooses to focus on the positive things that her mother taught her. I highly recommend CHARLOTTE AU CHOCOLAT for readers who enjoy touching memoirs or food-themed books. It's a sweet story that will touch your heart as it did mine. This definitely sounds like a good read! I do love foodie books! Will be keeping an eye out for this one. Food? You mention food? Well it does sound pretty heavenly to grow up around foie gras and Dover sole, two of my favorite things, but I bet it was pretty lonely for her. I'm totally sure I would love this book. Since pretty much food is all I think about these days. I usually don't pick up memoirs, but this one sounds intriguing. I can't wait to read this book - you know me and memoirs. The fact that food's involved makes it that much better! It's rare for me to pick up a memoir, but I've heard such good things about this one that I'm going to read it! I'm so glad you gave this one a try. It is a fast read, but it's deeper than it first appears. This book sounds awesome. I don't know how I missed it on Beth Fish Reads. Off to put it on my to-read list! I don't read many memoirs, but I think I'll have to pick this one up. This is a wonderful book. I've already bought 3 copies to give to people, and I will be buying many more. It's beautifully written, funny, witty, and so moving.